Besides eating bag after bag of starburst jellybeans, not a whole lot of Easter happenings have been going on around here. 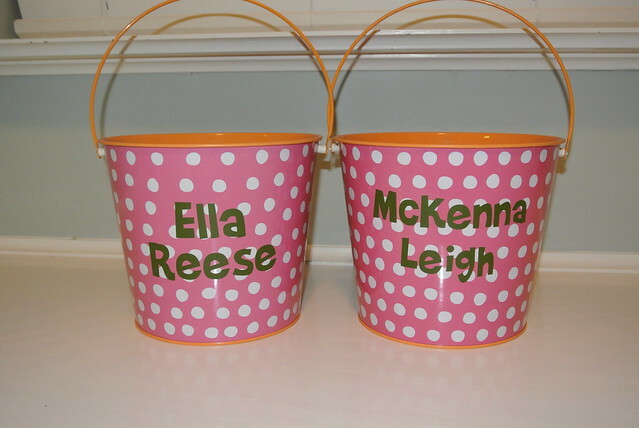 I did buy these cute Easter buckets for 5 dollars at target today and used my silhouette to cut out the girls names in vinyl. Last year Ella and I silk-dyed eggs using ties and Kristen made paper mache eggs. I have seen so many cute Easter crafts on pinterest that I hope to do next week. These are definitely a "during McKenna's nap" kind of craft but look like so much fun! Maybe Ella would actually eat her lunch if I did this. I think I will try the kool-aid method for dying eggs this year. I can't wait to do this someday! What a fun adult egg party idea! Who says Easter egg hunting has to stop when the sun goes down?! Glow in the dark Easter eggs! Genius. 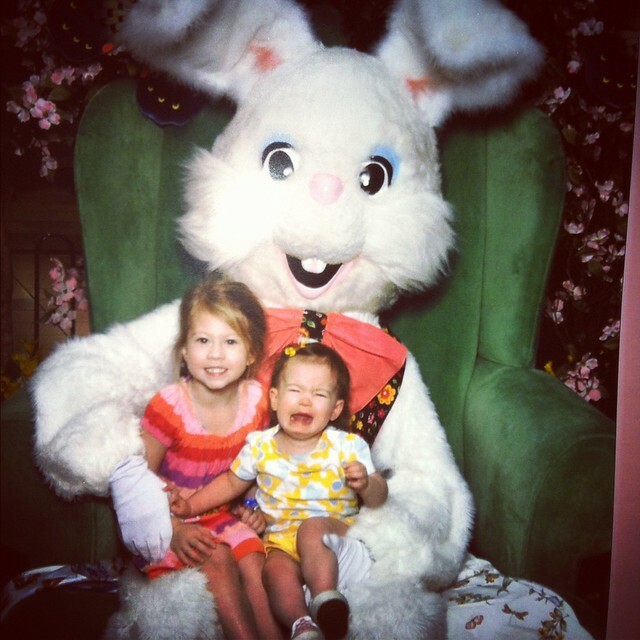 I will leave you with this classic Easter bunny picture. McKenna feels no different about the bunny as she did Santa. Poor McKenna! That last picture is definitely a framer! Thanks so much for sharing the glow in the dark easter egg hunt with your readers. It means a lot to me. I love to see ideas shared from my site. That is definitely a classic photo!! THAT PICTURE is awesome!!! And love your sisters bday gift! Both of you are so dang pretty!!!! ella's new and improved splint!